Unlike its name, the Black-tailed Prairie Dog is actually a rodent species and is one of the five prairie dog species of America. They are known by many names like Arizona black-tailed prairie dog, barking ground squirrel, pispiza, prairie marmot, prairie squirrel and petit chien. Both the appearance and the activities of these wild creatures are bound to remind of squirrels and chipmunks, the group to which they belong. Size: The length of the male can vary between 358 and 415 mm, while the female can be anything between 352 and 375. Weight: The males weigh between 850 and 1,675 g, females are between 705 and 1,050. Body Fur/hair/coat: The large, stoutly-built body is covered with tan to pinkish-brown fur on the dorsal side, while the ventral side has whitish to buff color fur. Head: The head is round having large, black eyes set just below their small, rounded ears. They have long human hair-like eyebrows and whiskers under the nose. Tail: The tail is short with a distinct black marking on the tip, from which it gets its name. Teeth: Like most other rodents, the incisors are long to help them bite through the grass and weeds easily. Sexual Dimorphism: The males are larger and 10 to 15% heavier than the females. The longevity of these animals in the wild is not yet known; however, the males above 3 years of age have a high mortality rate, while the females live a bit longer. 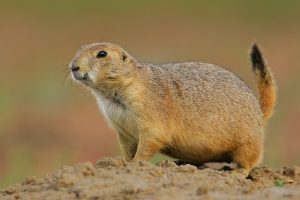 The black-tailed prairie dogs are widely scattered throughout the Great Plains of the continent of North America, covering the area from the Canada-US border to the border of Mexico and the US. The preferred habitat of the black-tailed prairie dogs includes open and arid plains near river flats and bottomlands that are covered with natural vegetation like short grasses, prickly pear, greasewood, and sagebrush. These rodents will typically avoid wetlands and biomes with excess humidity. 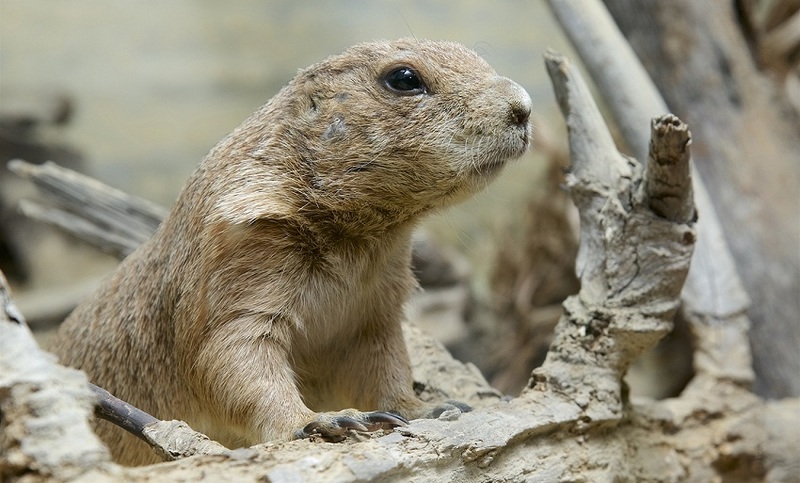 Black-tailed Prairie Dogs are diurnal and have a high socialization instinct. They live in a close neighborhood that is further divided into smaller families lead by a single male along with 1 to 4 females and their baby to young offspring. Wherever these rodents would go, they would move in large groups of up to a thousand individuals. They have an impressive habit of greeting each other either by nose to nose touch, or else, touching each other’s incisors by turning their heads sideways. They are always active during the summer months, but during winter, they would emerge out of their burrows only after sunrise and retreat before sunset; however, they would not hibernate. During the rains, they usually spend the time inside their holes. These animals are territorial. They would work together to make burrows, and at the same time, stand together against the individuals belonging to the other groups. 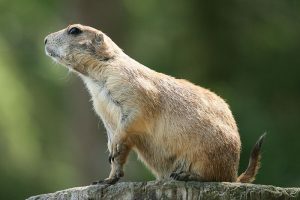 The black-tailed prairie dog are vocal and would communicate with each other by many different kinds of calls including barks, yips, growls, and chattering. When a prairie dog is threatened, it would wheeze or chirp to alert others in its group, while the others will pick up the call and relay it to others as a sign of warning, thus alarming the entire group. However, when these rodents are safe, they display playful behavior by yipping and leaping in the air, followed by others, with the entire group enjoying together. The black-tailed prairie dogs are primarily herbivorous, and their first preference is grass, followed by the tender shoots, seeds, sedges, flowers, and leaves of forbs and other weeds. However, they also occasionally consume grasshoppers, beetles and different kinds of insects. 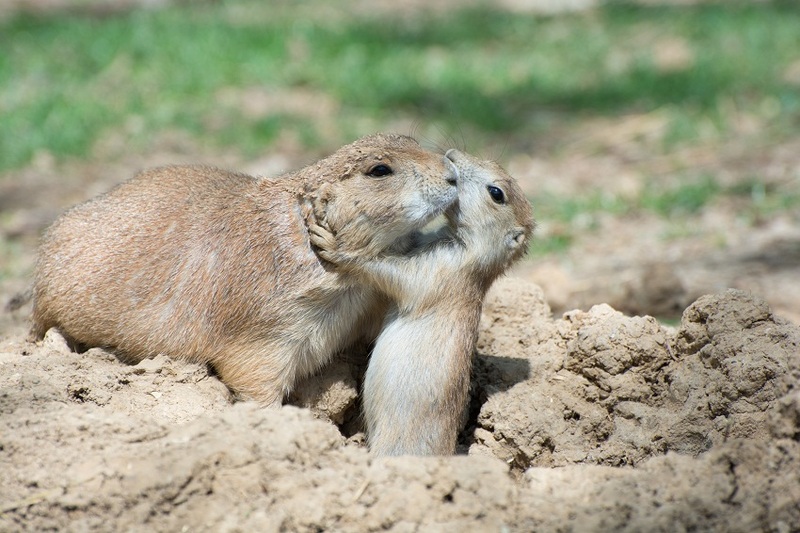 The mating season of these prairie dogs is springtime – between February and March. The gestation period of the female is only around a month, after which, it gives birth to three to four pups. However, a female can have only one litter per year. 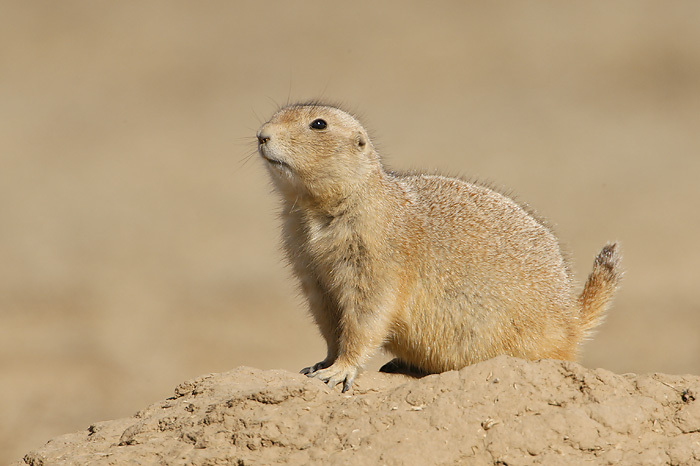 The prairie dog pups are altricial (i.e., naked and blind when born and dependent on parents for food and care) and continue to live in the burrow until they get their vision and learn to move comfortably. This might take up to six or seven weeks, after which they are weaned. However, the juveniles will continue to stay near their mother for about two more weeks. When the females would have babies, they turn quite aggressive. They are often found fighting with other females for guarding their territory and the babies since the females are prone to kill the babies of other females and invade the burrows. 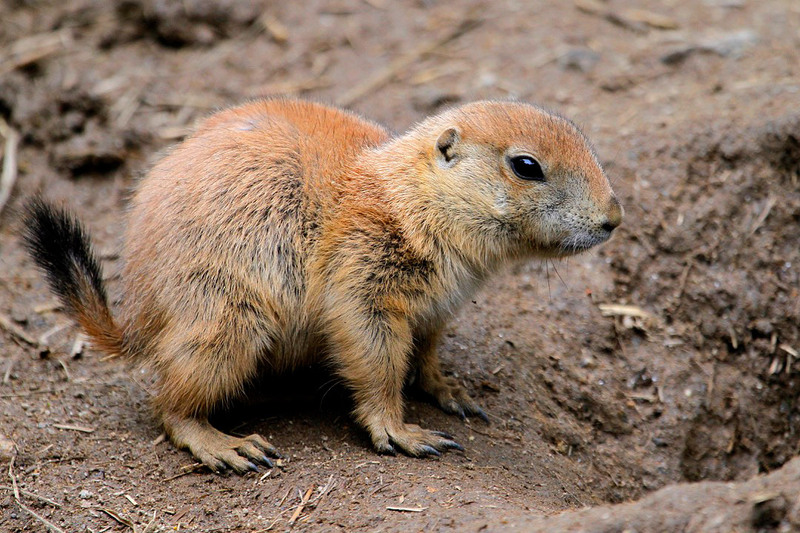 It takes around 15 months for a baby prairie dog to reach full sexual maturity. 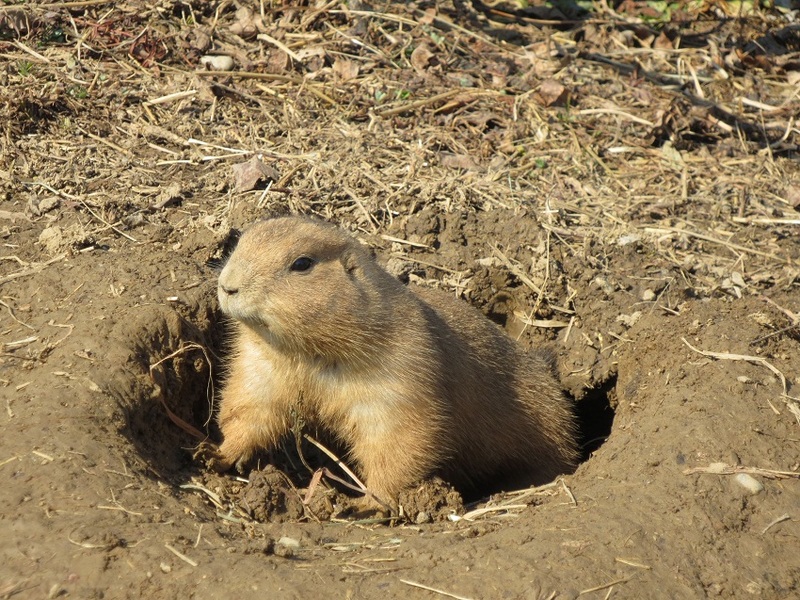 As an interesting behavioral adaptation, these rodents would eat up all the plants around its burrow, which in turn help them to spot predators without much effort. Before autumn begins, these animals would put on a layer of fat that will help them survive comfortably in the biting cold of the winter season. Quite much like the ground squirrel, their cousin, the clawed toes in the forelimbs are adapted to help them grip food (like nuts) while chewing. The color of the coat differs slightly in different seasons, with the hairs getting relatively darker during winter (to catch sunlight and keep the body warm), and whitish during summer (to reflect the sun rays and help them resist the heat). 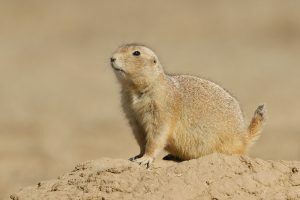 While the black-footed ferrets were one of the major enemies of these prairie dogs, the scenario has changed since the time they have become endangered. At present, they mostly fall prey to predators include bobcats, coyotes, prairie rattlesnakes, ferruginous hawks, American badgers, golden eagles, and red-tailed hawks. Though the population of the black-tailed prairie dog is not endangered (but rather stable), it has actually gone down to 95% compared to the past. These creatures were probably the most abundantly-scattered mammal of North America. However, in the latter decades, different threats like habitat loss have cut down their numbers dramatically. At present, their world population is estimated to be around 10-20 million. The IUCN 3.1 Red List has enlisted them as ‘LC’ (least concern). 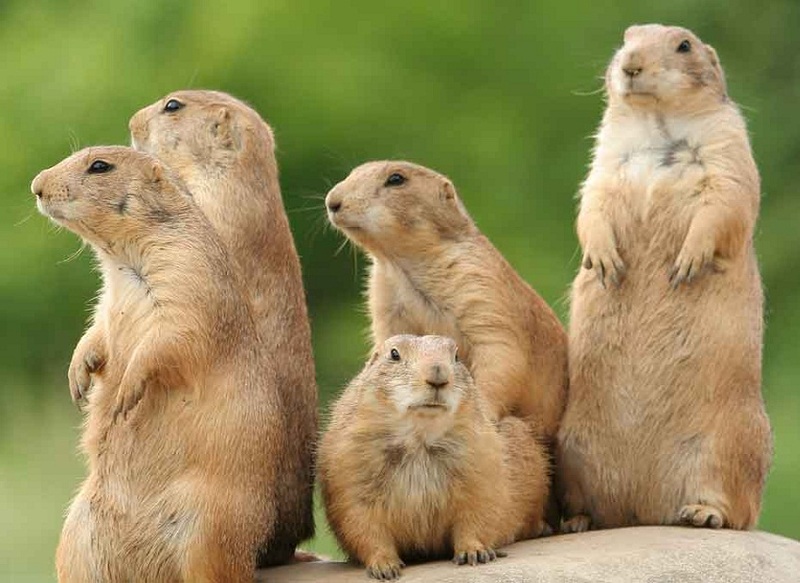 A group of prairie dogs is called a ‘town’ or a ‘coterie’. 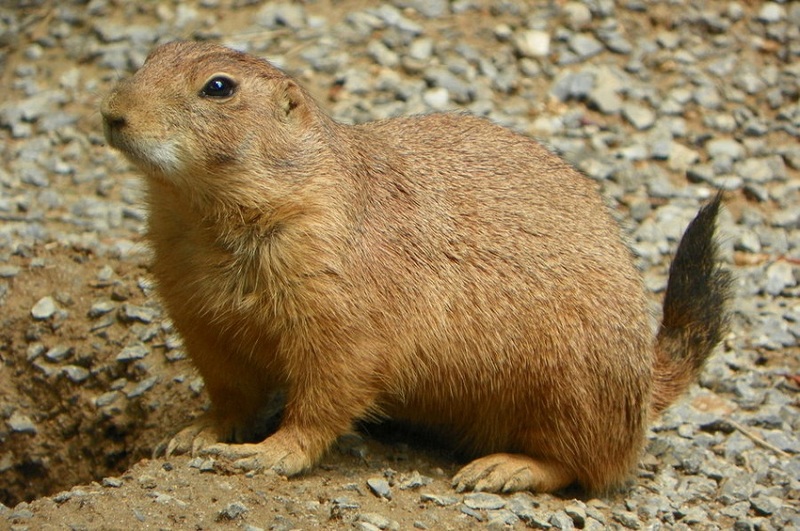 Prairie dogs had been very popular and common in the pet trade until 2003, when the US government imposed a ban on catching, trading, selling or transporting these animals. The ban was, however, lifted in 2008. Reportedly, a black-tailed prairie dog town in Texas included almost 400,000,000 individuals, covering an area of about 64,000 sq. km. They get the attribute ‘dog’ in their name for their characteristic dog-like yipping sound.